Today we kept our position of 175 miles south of the eddy. Tropical storm Franklyn is still centered too close to our eddy for us to comfortable move in so it is necessary for us to wait. During the waiting time we started assembling the sampling sled and sampling equipment. We have a collection of integrating samplers. They consist of a niskin bottle with a collection jars attached to them. 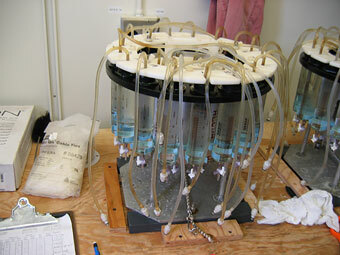 These jars have a vacuum pulled on them and allow us to collect water samples. We will also be collecting them using glass syringes on an apparatus that is nicknamed the medusa. With any luck the storm will move out and we will be collecting water samples as soon as possible.